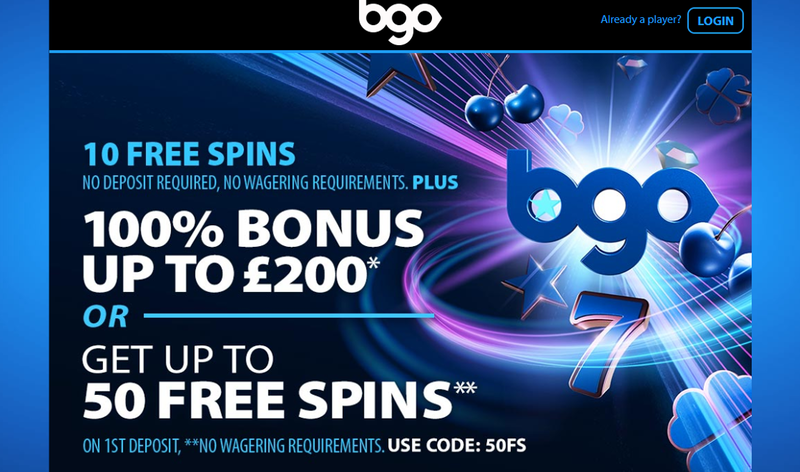 Bgo Bingo Mobile | You Have 10 FREE Spins Here! Bgo brands itself as the ultimate gaming site, and to be quite honest, I am inclined to agree with them. If you join today, not only will you get access to one of the best bingo, casino and sports betting platforms, you will also get access to an incredibly rewarding new player bonus, entitling you to your choice of either 100% extra up to £200, or up to 50 free spins on your first deposit. Plus, you will also get 10 FREE spins on sign-up with no deposit required. The Bgo Mobile app has incredible functionality. It’s fully compatible with Apple iPhones, iPads, iPad minis, Android phones, and tablets, plus all Blackberry devices. The site will allow you access to a full range of bingo, casino and slots games, allowing you to play any of your favourites, just as you would on your laptop or PC. New Players Only. T&C’s Apply. 18+ Gamble Responsibly. Get 100% extra up to £200 or claim up to 50 free spins on your first deposit. 10 free spins, no deposit required. Regularly updated promotions and ongoing bonuses. When it comes to bingo games, this is an area in which Bgo specifically excels in. Each day there are guaranteed jackpot games, where players will win prizes of £250 or greater. There are free bingo games that start several times a day, and unlike a lot of other sites, the jackpots are fairly decent, current ones include prizes between £1 and £100. Cards start from as little as 2p also, so you don’t have to be a high roller to get started and have a punt at this site. Aside from bingo games, Bgo has a fantastic selection of slots. In fact, the slots selection is much larger than virtually any other site we review at Mobilebingosites.org.uk. At the time of writing, there are well over 100 games, of these games, most are big titles that you will be familiar with. For example, you can easily sample games like Cleopatra, Da Vinci Diamonds, Dungeons and Dragons, Fluffy Favourites and more. The same can be said when it comes to casino games, again, another area in which Bgo excels. You will find everything from Blackjack to Roulette, to Poker. Plus there are some live casino games, so you can play with a ‘real life’ dealer instead of a computer if you so choose. New customers only. 10 Free Spins on registration (UK only). * 40x wagering. Game weightings apply. **Up to 50 Free Spins. Use code: 50FS. 1 Free Spin for every £1 deposited. No Neteller/Skrill. Selected Games only. Visit the official website for full terms. Although we only feature industry leading sites at Mobile Bingo Sites, Bgo may just take the proverbial biscuit. The mobile app is absolutely flawless, giving fluid game-play on the move. So whether you fancy playing on your iPhone, on the sofa with your tablet, or even a sneaky game during lunch on your work PC, you can be assured of an absolutely phenomenal time. Now when you factor in the large bingo jackpots and the free spins bonus, this really is a site that must be looked at. On top of that, I had a sneaky look at the terms and conditions and the wagering requirements seem quite generous compared to the majority of sites around. All of these things together build a case for Bgo Bingo Mobile. I say give it a go, claim your 10 free spins, no deposit bonus now!